Our 1h Guided Tour starts with a walk of about 500 meters along the harbor edge. We dive into the atmosphere of the harbor and roam the UNESCO World Heritage Site "Speicherstadt". the secrets of the concert halls, their acoustics and the current program. Finally, we enjoy the panoramic view from the outdoor plaza. We show and explain the city and its "gateway to the world", the harbor, from above. 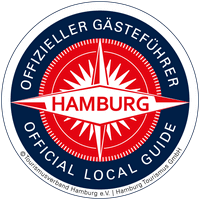 The tour starts at the subway station Baumwall / Elbphilharmonie, line U3, exit Kehrwiederspitze in front of the kiosk (Back Shop), 20459 Hamburg. Note: Guided tours of the concert halls are only offered as part of the concert hall tours. We also like to do this tour on request by e-mail in other languages (for example Russian). the neighborhood quarters of the Elbphilharmonic Hall in HafenCity, Hamburg's youngest district and currently the largest inner-city construction area in Europe. The tour starts at the subway station Meßberg the line U1, exit Chilehaus, 20095 Hamburg. For a booking request please write us - as with all other questions - a short e-mail. We also like to do this tour on request in other languages (for example Russian). © 2018 Elbphilharmonie Plaza-Führungen, alle Rechte vorbehalten.